A Sound Level Calibrator is used to produce a known sound pressure level. It is a hand-held device that emits an audible tone of very accurate level and frequency. Typically the calibrator is fitted over the meter’s microphone and the reading is either checked manually by the user or automatically by the meter. Calibration at regular intervals is a way to safeguard the quality of measurements and to eliminate the costs caused by unreliable equipment. It also ensures that historical measurement data is valid and comparable. Depending on the use, measurement environment and internal quality control programs, it is recommended that microphones are calibrated at a dedicated calibration laboratory at least once a year. There are two types of sound level calibrator, mechanical and electroacoustic. The pistonphone is a mechanical type, generating a sound pressure by driving small pistons with a cam, and will normally have a frequency of 250Hz. A correction has to be made for atmospheric pressure, but these devices are generally more accurate and stable, hence more commonly used in laboratories. At 250Hz, we don’t have to worry about different microphone types. The electroacoustic types are based on a small loudspeaker, driven by an oscillator, typically at 1kHz, a convenient frequency when calibrating A-weighted sound level meters. As it’s an inherently less stable mechanism, an internal reference microphone is often used to maintain the correct level, and also correct for atmospheric conditions and microphone effective volume. Simpler, and hence cheaper, devices will not have these features, and can therefore only be used with a limited number of microphone types, or over a limited temperature range, with a reduced accuracy. Most calibrators generate a level of 94dB re:20uPa, which may have to be corrected according to microphone type. Why 94dB? Well, it’s 1 pascal of course! Performance is defined in BS EN 60942:2003, which is currently undergoing revision, which will undoubtedly tighten up the tolerances. The new 42AG Sound Calibrator from GRAS is an improved replacement for the very successful 42AB. The 42AG has multifunctional capabilities and is designed for fast verification of microphones and sound level meters in the field. 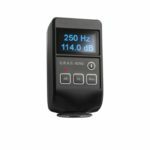 The new 42AG can calibrate at two frequencies; 250 Hz or 1 kHz and at two levels; 94 dB or 114 dB which makes it well suited for calibration of both sound level meters (normally calibrated at 1 kHz) and microphones (normally calibrated at 250 Hz). In addition, the 42AG can calibrate at two different sound pressure levels. A normal level of 114 dB, typically used for microphones with medium sensitivity and a low level of 94 dB makes it possible to calibrate high-sensitivity microphones without overloading them. The 42AG is battery powered and designed specifically for in-field use, has an easy-to-use OLED display which displays all the key data including ambient air pressure and temperature. The calibrator works with microphones from 1/8” up to 1” diameter (with a suitable adapter) and fully conforms to IEC 60942 for a Class 1 sound calibrator.